My boys recently saw the animated film, The Lorax. They did not go in with high expectations for the film, more for the fun of seeing a movie with good friends and curious to how the beloved Dr. Seuss book with the same name would be adapted to the big screen. One of my sons liked it more than he thought (read review below), the other one not so much (review to follow). I didn’t see the film but have read the book and love the way Dr. Seuss tells a story involving serious issues and conflicts and–depending on what the characters choose to do–the repercussions that follow. This leaves the reader to ponder what they might do in the same situation. In The Lorax, Seuss shows us how our greed for material things and over consumption of natural resources will have (and already has) serious implications for the Earth and its inhabitants. 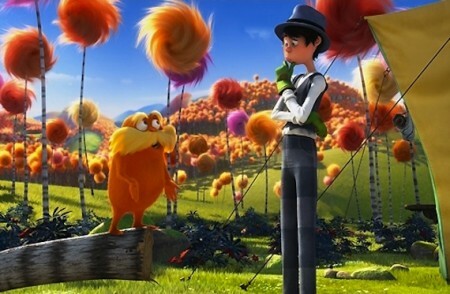 The Lorax is loosely based on the classic Dr. Seuss book by the same name. It is about a young boy named Ted who sets out on a journey to find a tree for Audrey (which is also the name of Dr. Seuss’ wife) who he is in love with. He meets the Oncler who tells him the story of the Lorax and helps on his adventure. Along with his grandmother, his mom, and others, he embarks on a quest to find a non-plastic tree in his all plastic world, guarded by evil businessmen. However, if he doesn’t believe in his mission a lot he just won’t make it, he will not!!!!! 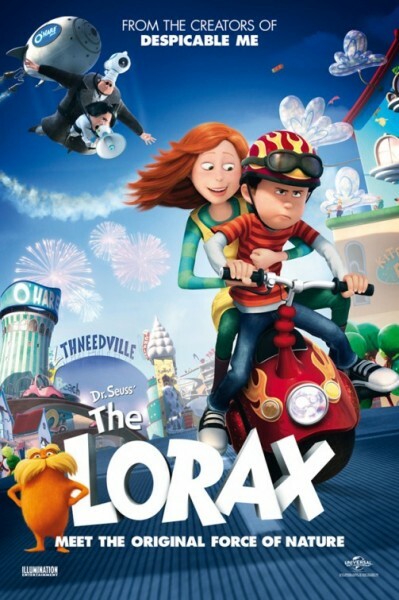 The Lorax is a surprisingly good family film with so-so songs, a great voice cast, and creative animation!!!!! Walking into the theatre I had pretty low expectations. Expecting to give it two stars, I was also wondering how the film would live up to the book. But in the end I was happily surprised. The movie is a musical. When comparing the songs to those of another recent family-friendly movie musical, The Muppets, the Lorax’s songs are just okay. “How Bad Can I Possibly Be” isn’t really that bad and “Let It Grow” is delightfully cheerful. But the show stopping opener has been done better and has been done before. None of them are as great as “Life’s A Happy Song” and the Oscar-winning “Man Or Muppet,” but they are okay. Compared to the mega-popular blockbuster, Despicable Me (made by both the same studio and directed by the same directors) this is way better. Despite The Lorax‘s massive opening weekend at the box-office, I’m afraid that bathroom jokes and annoying minions will live on longer than the movie form of tree-choppers and furry orange animals. 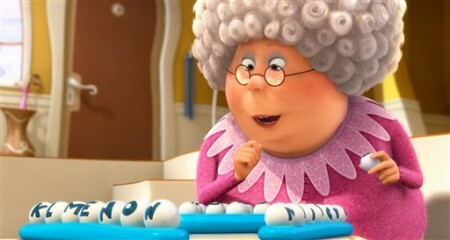 The Lorax does have some joyful jokes and great gags. My favorite? The part in which the Lorax robs the Oncler’s bed and all the tree animals start singing the Mission:Impossible theme song. I also loved the beautiful animation, even though at times it is a bit too candy colored. The 3-D is okay. It doesn’t even come close to Hugo, which I think is the best 3-D ever (I haven’t seen Avatar in the format of 3-D). But, hey it’s still always cool to see things go fly right up in to your face. After watching this I want to go back and rewatch Dr. Seuss’ Horton Hears a Who, from 2008. My favorite scene is when the Lorax and the tree animals sing the Mission:Impossible theme song because it is hilarious and a neat and funny reference. My favorite character is the Lorax because of Danny DeVito’s Robin Williams as the Genie in Aladdinish voice acting. The movie is rated PG by the MPAA for brief mild language. The movie is rated G by Flack because there is nothing that inappropriate about it and so that more younger kids could see it and because I think they would like it. With a great voice cast including Zac Efron, Taylor Swift, and Ed Helms, as well as the fabulously funny Betty White and Danny DeVito plus a great moralistic message, this a great movie. It’s even better than Cars 2 (the worst Pixar movie ever). And beneath the movie’s so-so songs, candy colored animation and okay 3-D it is a terrific tribute to Dr. Seuss. Ted lives in a world without nature.Â Everything is plastic, nothing is organic.Â But when Ted’s girlfriend says what she really wants is a tree,Ted becomes determined to find one. Ted’s grandmother tells him in order to find a tree, he must go on a journey to find the Onceler. Ted learns the story of the Lorax and decides to change his town. How the Grinch Stole Christmas, The Cat in the Hat, Horton Hears a Who!, and now Dr. Seuss’ The Lorax have all been made into feature films. The new film is the first 3-D Seuss film and with voices by Zac Efron, Taylor Swift, Danny Devito, Ed Helms, and Betty White, The Lorax is surprisingly not enjoyable.Â The real reason why this film isn’t going to stand the test of time, is simple: the message Seuss displays in the original book gets lost in the (mostly) forgettable musical numbers and added characters who aren’t very interesting. 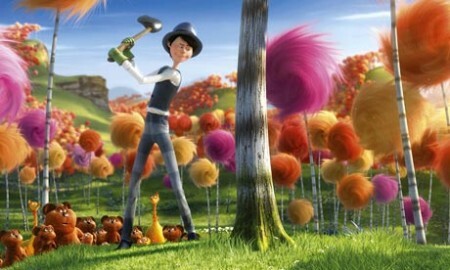 Even the character of the Lorax differs from the book; in the film he becomes more of a comic relief. The “that’s a woman” joke is so unSeussian that I wish the Despicable Me crew sent this to Pixar. Imagine a John Lasseter directed Lorax with John Ratzenberger as the Lorax. Okay, maybe give Ratzenberger a smaller part, but it would still be better than this version. Why didn’t I give this zero stars? There are redeeming qualities but nothing in the film is above good. The only redeeming quality the 3-D adds is that it doesn’t distract from the story because it does so little. It doesn’t even get in your face! I think that’s where the film comes short. I don’t need 3-D in my face, but I do want the message to be evident. The story and message don’t tear out your eyes to aware you to stop cutting down trees, instead fans of the book (like me) are rewarded with unmemorable songs and low quality entertainment. So in the end I wish The Lorax did come in my face; if only the story was right in front of me. As Dr Seuss might have said: the film is so poor and it’s mostly a bore. My favorite character is the Onceler because I liked seeing the different characteristics he had during his life shown in the film. My favorite scene is when the Lorax, the bears and the fish put the Onceler in the river while he’s in his bed, because of the Mission Impossible theme rendition, the original music and the textured CG. The Lorax is rated PG for some mild language and brief rude humor.Â If only the one swear was cut (I don’t know which humor was rude), then it could have been G.
The Lorax is great for younger kids, but serious Dr. Seuss fans will be disappointed.